You may remember Part 1 of our The Dark Knight Rises set visit a couple of weeks back and now we have some more to share with you, specifically our interview with producer Jordan Goldberg as well as some of the technical crew working with Nolan to make the final chapter of his Batman trilogy. As a reminder, all these interviews were conducted back in August before anyone knew almost anything about the movie as a group of journalists sat in the press skybox at Heinz Field in Pittsburgh while Nolan shot a scene of Bane disrupting a football game by the Gotham City Rogues. Ironically, this visit took place the same week as literally dozens of pictures of Catwoman and Bane ended up on the internet from the outdoor location shoot. 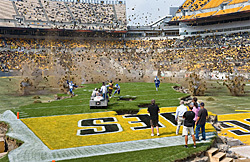 Warner Bros. Pictures has provided SuperHeroHype with a brand-new image taken on the day of the shoot as Heinz Field literally explodes in the middle of the kick-off play, disrupting the game. In the shot (click here for a bigger version) you can see some of the things we discussed in Part 1, and you can get an idea of how many extras were actually in the stands. We imagine that when FX coordinator Chris Corbould was done with the shot, the stands in the arena will be completely filled. See if you can spot director Christopher Nolan in the picture and we’ll let you know at the end of this report so you can see if you got it right. Jordan Goldberg hasn’t been working with Nolan as long as Emma Thomas (who we spoke to in Part 1) but he joined the team with The Prestige as an associate producer and was involved with writing some of the auxiliary material for The Dark Knight and Inception, including “Batman: Gotham Knight” and the Inception motion comics. While on set, we mainly spoke with Goldberg about shooting at Heinz Field in Pittsburgh and the scenes filming that day.